We don’t know why the police are known as the ‘old bill’ (amongst many other names) in TLCB’s home nation. Whatever the reason, today’s post looks like really old bill, being a gloriously ancient-looking police car inspired by Mercurys and their like from the 1950s. UK cops had to make do with embarrassing stuff like this* in the ’50s, so we’re loving this Model Team build by previous bloggee Redfern1950s. 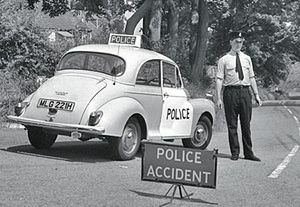 There’s more to see of his brilliant 1950s police car on Flickr – click the link above to dial 9-1-1.